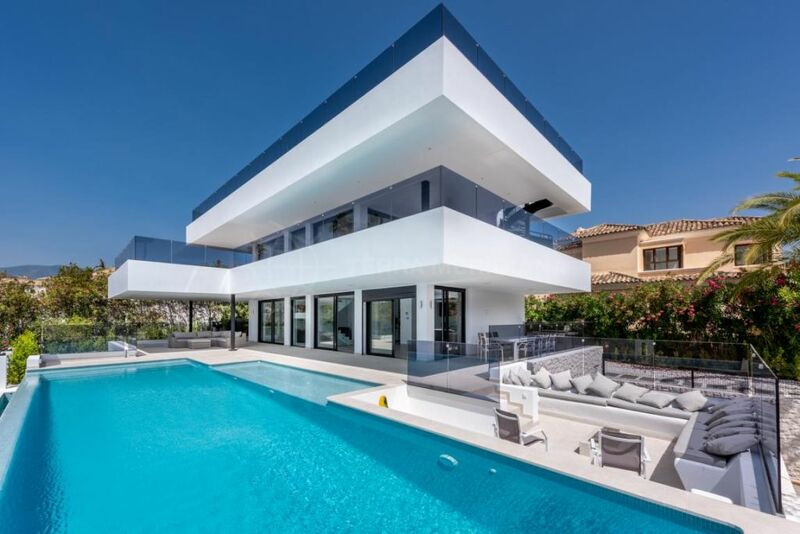 This graciously appointed three storey residence with a breathtaking rooftop terrace is situated in the tranquil residential neighbourhood of Nueva Andalucia. Enjoying stunning sea and mountain views the interior design reflects a modern but timeless style with comfort predominating while emphasising refinement and discreet luxury. The main floor offers a hallway, guest toilet, contemporary kitchen with high-end appliances, and a sizeable open concept living area which connects to 5 ample porches, the green Mediterranean garden and heated pool. There are also 2 ensuite bedrooms on this level. The first floor is comprised of an ensuite master bedroom with walk-in closet and terrace with jacuzzi as well as another ensuite bedroom. The lower level features a three-car garage, laundry room, storage, games room, gym with sauna and spa, and a guest bedroom and bathroom. Los Olivos is a secure and gated development close to 3 acclaimed golf courses; Aloha Golf Club, Real Club de Golf Las Brisas and Los Naranjos Campo de Golf. Puerto Banus and the beaches are just 7 minutes by car, and Malaga International Airport is at only 40 minutes. "The perfect haven for unwinding in the heart of the Marbella Golf Valley." Please, send me more information about ref TMXV08147, Villa in Haza del Conde, Nueva Andalucia or similar properties.